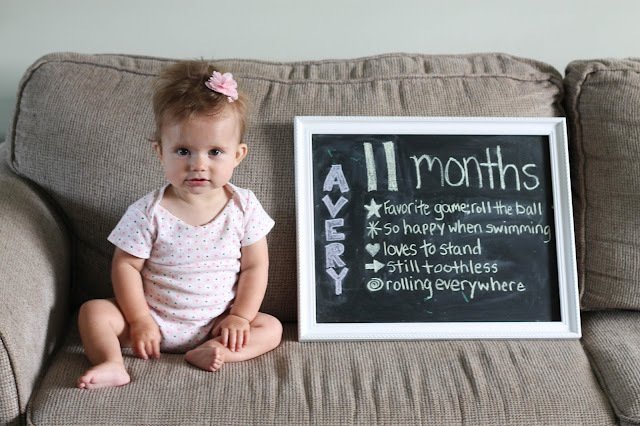 This Happy Life: Avery is 11 Months! Better late than never, Happy 11 months Avery Jane!! Sleep - You're still a good sleeper in the sense you sleep through the night, however, you are waking up earlier and earlier lately and it's definitely having an effect on me! You've started to eat more and more finger foods this month. You love watermelon the most I would say. Usually whatever we're eating now I give you, in tiny tiny pieces of course because your Mama is crazy. Weight - If I had to guess maybe a little over 17lbs? Teething - Nada. But everyone who sees you says you're teething so finally I have some people on my side. Your Dad will believe it when he sees them. I can see tons of white through your gums so I don't know if you're going to be lucky and get them all at once sine you're getting them so late? I really hope not baby girl! Development - You are not officially crawling because you don't get up on your thighs but you are moving. You never stay in one spot and move all around the room, either by rolling or crawling backwards. You LOVE to stand. If we bring you to standing position you refuse to sit down. You have learned how to go from the crawling tummy position to sitting and vice versa. Personality - This month I'd say you have been pretty cranky and it's been a little rough. You don't like to be alone and you won't let anyone else hold you except me or Dad. It can get a little tiring but I keep telling myself it won't always be like this. When you're not cranky though, you are super happy. You have starting nestling your head into my chest when you're tired and it's the cutest. I cannot believe your next monthly update you will be ONE! Like really, that came fast. I am going to enjoy this last month before your big milestone but I know it's going to be here before I know it! I love you so much baby girl!